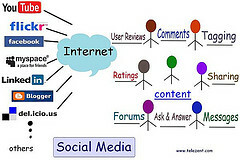 What power do networkers have when interacting with Web 2.0 tools? Is power important? Why? ← #CritLit 2010 What syntax, pragmatics, context and semantics mean to me? Oh it is that Danah Boyd whose text we are now reading. Thanks for ‘giving faces’ to her. There was a lot discussion about this video in web 2.9 Expo and after that. The text is more interesting to me now, thanks.